TomTom's innovative Bandit action camera stands out in a crowded field. It's the only action camera that removes the pain of editing with its 'shake to edit' feature, which enables you to upload and share edited footage quickly without having to manually edit it. The Bandit is also well supported by TomTom, with the company continuing to invest in its existing hardware with performance-enhancing updates. The latest of these arrives just in time for summer, and enables the camera to automatically detect if it's submerged in water, and adjust the colour balance accordingly. Ordinarily, when filming below the surface a correctional filter has to be attached to the camera lens to avoid unwanted colour casts. 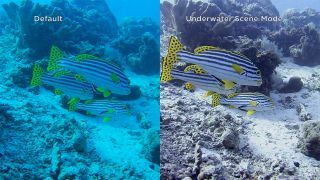 The new in-camera feature works by simply applying a red filter to remove the blue and green casts caused by underwater filming, ensuring that the footage you capture is balanced and vibrant. Updating the software is easy – it can be done in a few minutes by simply pairing the camera with either the Bandit Mobile or Studio app. Taking the Bandit underwater does require the fitting of a waterproof lens cover, which is purchased separately and simply clicks onto the front of the camera, replacing the standard cover. The latest update also features automatic gain control for the internal and external microphones, and audio settings are now stored between recording sessions. Another new feature, and a big help when it comes to manual editing, is the automatic splitting of footage into separate 4GB files; this saves on time finding clips when it comes to organising and archiving your footage. It's great to see the Bandit continuing to receive major updates from TomTom – this is one of the few action cameras that has true ongoing support from the manufacturer.